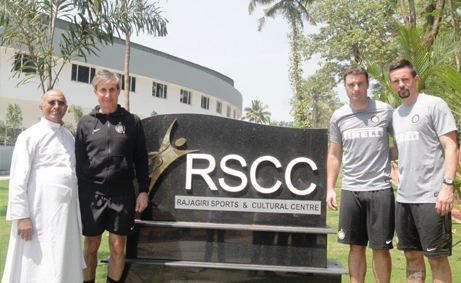 A team from the Inter Milan club headed by their technical director Marco Monti, Stefano Rapetti and Andrea Ratti visited the Rajagiri Campus at Kakkanad and Kalamassery. 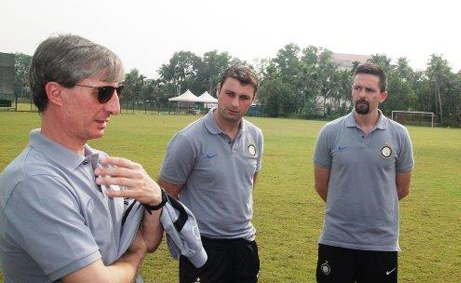 The inter Milan team was on a visit to assess the football talent in Kerala, on the lines of starting an Inter Milan Football academy in India. Marco was impressed by the importance that, Schools in Kerala gives for physical education and highly appreciated the talent by the children who participated in the Inter Milan Football clinic organized at the Rajagiri Grounds. Teams from various parts participated and were coordinated by the Kerala Football Association. The KFA secretary P Anil Kumar was present during the football clinic He said that there is good talent which if coached professionally can generate players of international standards. The Inter Milan team toured the Rajagiri Facilities at both Kalamassery and Kakkanad Campus, and appreciated the investment done by the management for promoting sports and extracurricular activities. Taking a look at the newly opened Rajagiri Cultural and Sports Center, the team said that the facilities match international standards. The Inter Milan Academy will look at the possibilities of partnering with Rajagiri as its partner in Kerala with international coaches visiting the school regularly. 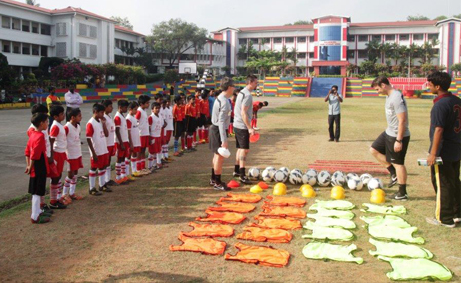 The students from the institute can also attend training programs at the Inter Milan Academy in Hosur. "We are very impressed with the support and hospitality offered by Rajagiri Staff and management. The response from the players was overwhelming. Definitely we look forward to partner with Rajagiri in our future endeavors" said Prashant Agarwal who represented Playon Skills. “We will be conducting more such activities to show the world that we have talent pool” said Rijin John, Secretary, Rajajagirians Conclave Inter Milan will be starting a residential football academy in Hosur this year and are looking to partner with the best of the schools in various southern cities to promote football and identify talent. The visiting delegation met with Fr.Jose Alex Oruthayappaly, Provincial - Sacred Heart Province, Dr. Joseph I Injodey, Principal – Rajagiri School of Social Sciences, Fr. Augustine Mampally, Director – Rajagiri Christu Jayanti Public School, Fr. Jijo Kadavan, Director – Rajagiri Public School.